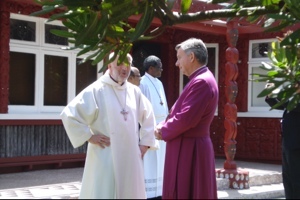 We are still learning about the multiple cultures and languages of the Anglican Church in New Zealand. 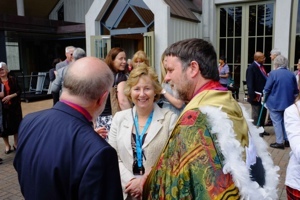 Three Primates is probably at least two too many – one for the New Zealand dioceses, one for the Maori Dioceses and one for Polynesia, Worship is multilingual and all clergy seem to be able to lead worship in Maori. I’ve added another remarkable hymn singing experience to the opportunity of singing ‘Lead Kindly Light’ in Finnish. This time it was ‘Guide me O thou great Redeemer’ in Maori. 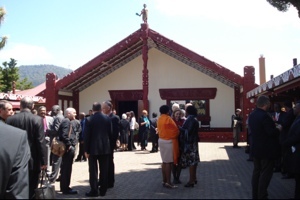 Yesterday we went to be received by the Maori King and Queen – which was quite an event with ceremonial speeches, exchanges of gifts and a lunch for everybody. Nothing is ever translated in these moments so one has to make guesses about what is actually being said.